A reminder from Superintendent Ahart about how weather-related decisions are made. Be sure to read the bottom of this page and see how you can be the first to know about weather-related closings, delays and early dismissals by following DMPS on Facebook or Twitter and/or downloading the DMPS Mobile App. The official start of winter is still more than a month away, but the weather doesn’t rely on a calendar. In fact, northwest Iowa is seeing snow today and the temperatures are dropping here in Des Moines. As Superintendent, a top priority of mine is always the safety of our students, staff and families. And when it comes to inclement weather, everyone’s health and well-being drives my decisions. After serving as Superintendent through four winter seasons, I know that weather-related decisions – regardless of what decision is made – are both supported and opposed. I know I cannot please everyone, but I want you to understand what drives my decisions. When extreme weather is imminent, the DMPS operations staff and I are actively investigating and monitoring the precipitation, temperature, wind chill, road conditions, and more. Additionally, I stay in contact with the superintendents of our neighboring districts, and we get information from the National Weather Service, the Des Moines Public Works department, and other sources to ensure that I have the most comprehensive information available to inform my decision. When the information supports it, I make the decision that I feel is best for Des Moines. That may differ from the decision made by our neighboring districts. There are a number of reasons for that, including: the number of rural vs. urban miles that buses need to traverse; the number of students who walk to school; coordination with Des Moines Area Regional Transit, which transports a number of our middle and high school students; and coordination of our very large food service operation (which provides the only warm meal(s) of the day for many of our students). I also consider the ripple effect a “snow day” has on the entire community: not only for our 33,000 students and 5,000 employees but for tens of thousands of parents and family members, many of whom must go to work no matter the weather. Whatever decision is made, and I realize any decision will have those who disagree, it is made based on the best information available and in the best interest of our students and staff. With this in mind, I encourage you to create a plan for your family in the event of a school cancellation, late start or early dismissal. I know these changes to our routine are disruptive and challenging for our families. Finally, regarding the timing of the decision, while my goal is to make a decision about the next day prior to the 10:00 PM news, that is rarely practical. Weather conditions can change rapidly, for better or worse, overnight. An announcement about a cancellation or delay in the school day is made as early as possible, and no later than 6:00 AM. 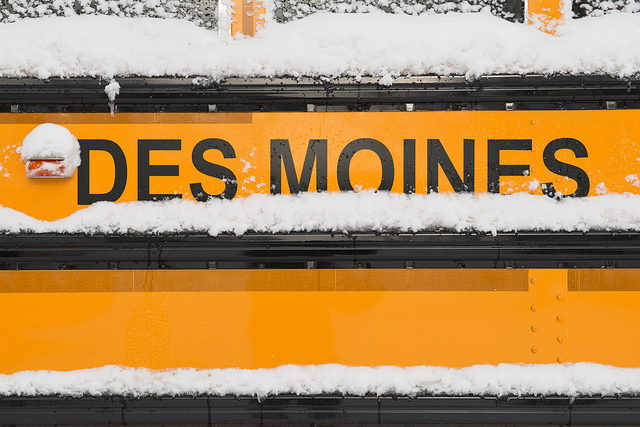 Thank you for your support of Des Moines Public Schools and your flexibility as we make our way through another Iowa winter. There are several ways DMPS notifies the community of weather-related cancellations, delays or early dismissals. First, it’s easy to find out directly from the school district. If you use social media, be sure to follow our Twitter or Facebook pages. You can also download the DMPS Mobile App to receive notifications on your phone. We also post such announcements to the DMPS web site and on DMPS-TV (Mediacom channel 12.1 or 812). Second, we use our Infinite Campus automated message system. If you have an Infinite Campus account, please make sure your contact information is accurate. If you do not have an Infinite Campus account, your child’s school can help you set one up. Finally, we notify our local media partners who normally share such announcements on-air or online. Weather-related announcements are provided to the Des Moines Register, KCCI-TV, WHO-TV, WOI-TV, KDSM-TV, KCWI-TV, and all local radio stations.